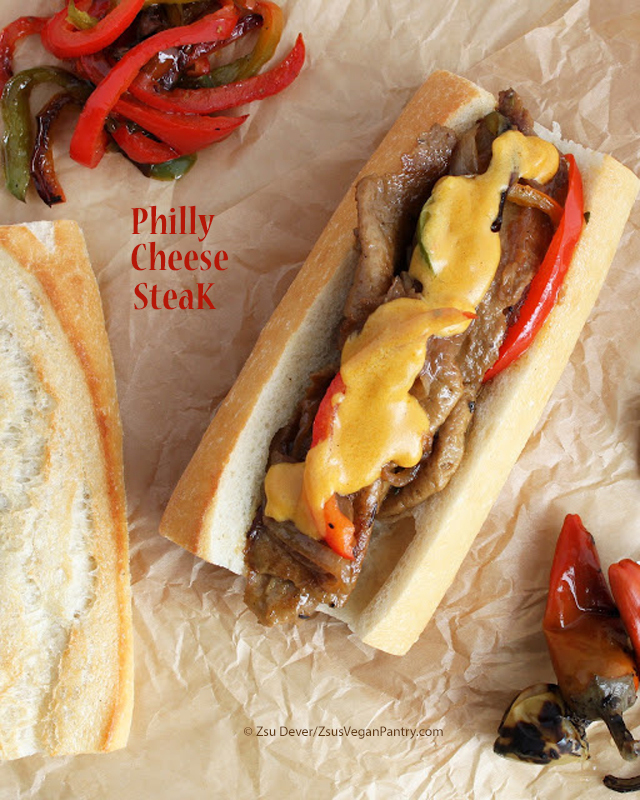 By now we are all familiar with the Philly Cheesesteak Sandwich, the popular sandwich made with cow parts, cheese-whiz and, sometimes, onion and pepper. I made that sandwich cruelty-free back in 2012 and it is one heck of a great eat. That one comes complete with SteaK Seitan and cheese sauce; I encourage you to go make it as soon as possible. But, less know is its cousin, Philly's Roast Pork Sandwich. Quite curiously, it turns out that locally this is the more popular of the two, and it is this week's Great Sandwich Remake. Taking a closer look, traditionally, it is roast pig, topped with provolone cheese and garlicky broccoli rabe (rapini) and roasted or pickled long hots or peppers. Rapini is in the brasssica family and is delightfully bitter. Not to mention, difficult to locate at time. Fear not, I offer you a sub in the recipe. 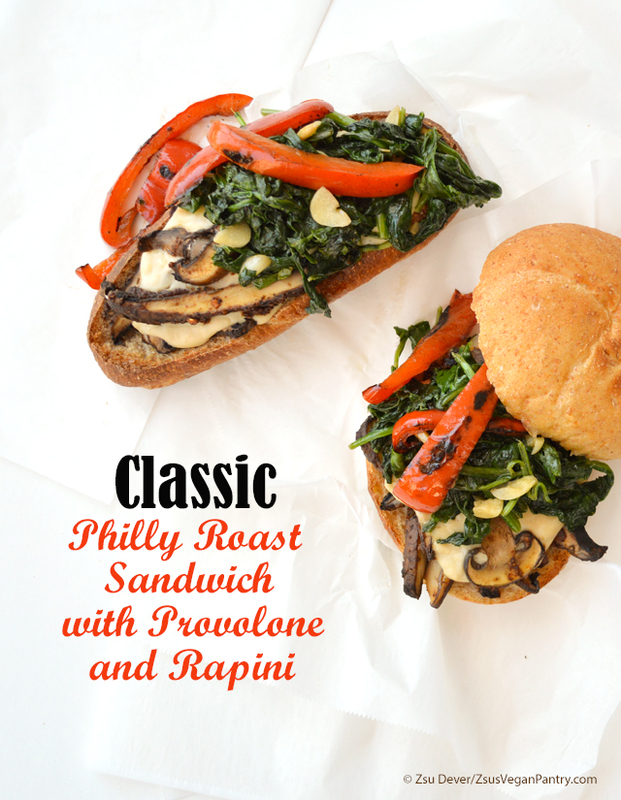 My kinder version of this sandwich, Philly Roast Sandwich with Provolone and Rapini, is made using seasoned portobello mushrooms. 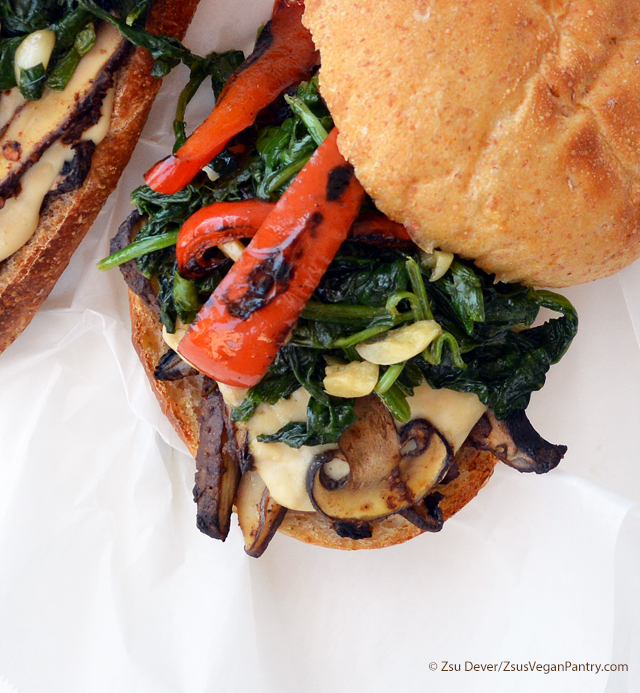 The mushrooms are roasted tightly covered, to retain moisture and flavor, which gives it a tender, yet toothsome-ness texture that this savory sandwich requires. 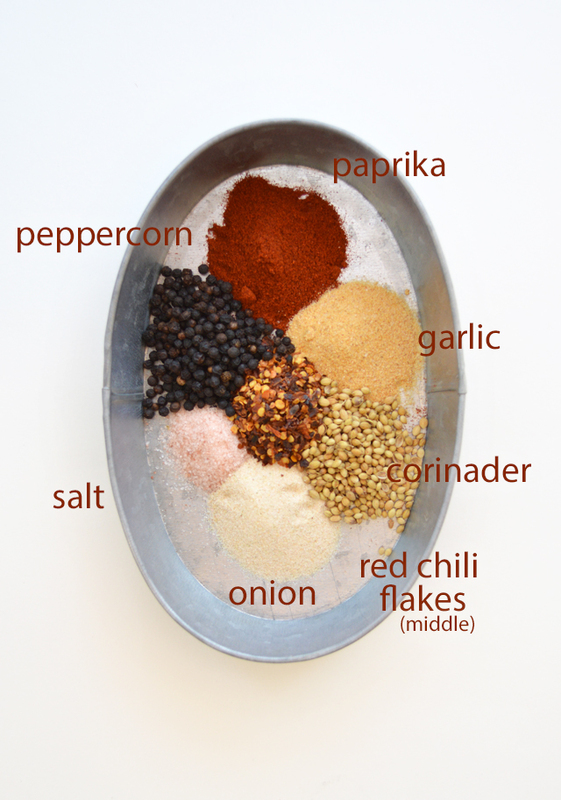 To get started, we need a good seasoning mixture and a few classic recipes I found use Montreal Steak Seasoning. Since I already have the ingredients to make the seasoning, I see no need to run out and buy some especially labeled that. It only requires paprika, peppercorns, garlic, onion, red chili flakes, salt and coriander. If you want to get fancy and toast the coriander and peppercorns, go for it; I just added everything to my Magic Bullet and buzzed it. Use a spoon to scrape the gills from the mushrooms, coat with the mustard mixture (we need to add flavor wherever possible) and sprinkle with the seasoning mix. Add a few sprigs of fresh herbs (required are Rosemary and thyme), cover very, very well, and roast for 45 minutes. Because the moisture is trapped in the pan, the mushrooms braise and roast, leaving a very flavorful and moist sandwich filling. Traditionally the roast sandwich is garnished with au jus because the meat is dry, but the way we cooked the mushrooms that is not an issue, so no au jus is needed. Slice the mushrooms very thin (about 1/4-inch) and make your cheese sauce (or buy Follow Your Heart Provolone Slices.) Since the classic sandwich has aged, sharp provolone, I decided to make it instead. Somer McCowan's Moxarella recipe and added a few "sharp" ingredients. Somer is also the author of The Abundance Diet, which is a pretty terrific book. Directions: are HERE on Somer's blog. Add everything to a blender and blend until smooth. 1. Preheat the oven to 375-degrees F. Combine 2 tablespoons of oil, the mustard and nutritional yeast in a small bowl. Mix well and set aside. Remove the stems and scrape the gills from the mushrooms. 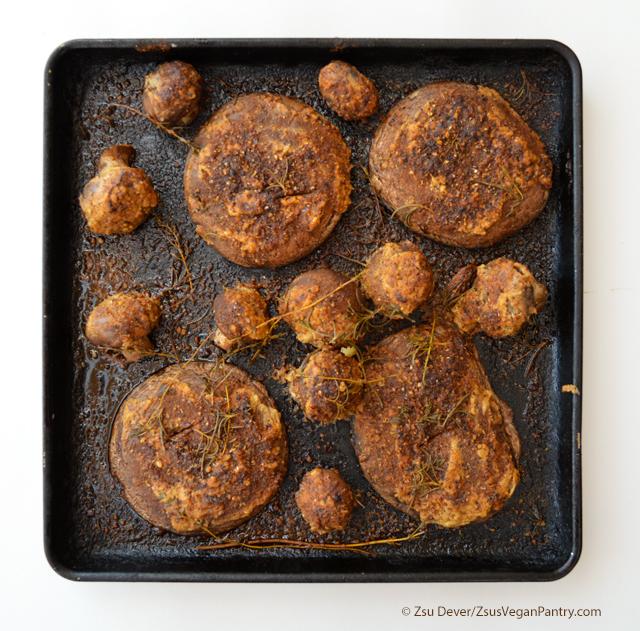 Place the mushrooms on a baking sheet, gill-side down, and spread all over with the mustard mixture. If using creminis, spread the mixture on the caps. Sprinkle the mushrooms with the spice mixture. 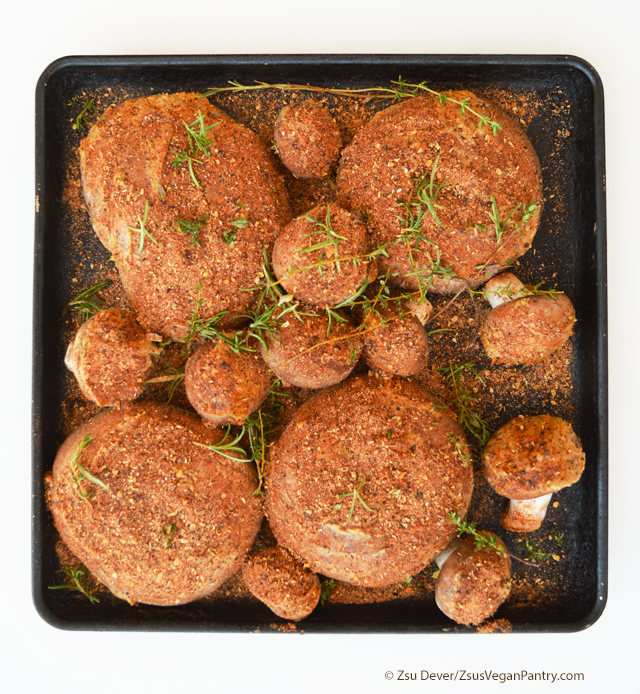 Remove the leaves from the rosemary and thyme and add to the mushrooms. Cover the pan with parchment paper and then tightly cover with aluminum foil. Bake for 45 minutes. 2. Chop the peppers into 1/2-inch thick slices. Heat 1 tablespoon of the oil in a large skillet over medium-high heat and add the peppers. Cook, stirring only after the peppers have begun charring. Season with salt and pepper and cook until crisp-tender. Set aside. 3. Heat the remaining tablespoon of oil over medium heat in the skillet and add the garlic. Cook until golden, stirring often. Add the greens and stir well using tongs. Season with salt and pepper. Cook until tender, but still bright green. If cooking rapini, add 1/4 cup water or vegetable broth, cover the pan and cook until tender. Remove and set aside. 4. 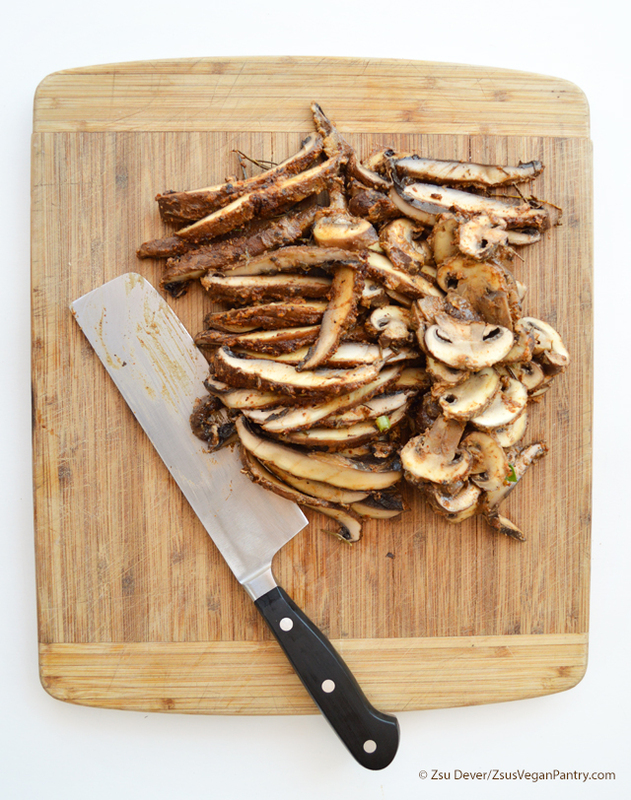 When the mushrooms are ready, remove them from the pan and cut into thin slices. Split and toast the rolls. Divide the mushrooms among the rolls, add cheese and broil until the cheese is melted and browning. Top with the rapini and peppers and serve. © 2016 Copyright Zsu Dever. All rights reserved. I saw a recipe for the meat version and have been wondering what to use instead of the pork. And here you've provided a recipe for the whole sandwich. Fantastic!! Alright! I'm very happy to help!